SO FAR THIS year, nine cyclists have died on Irish roads. In the same period last year, just three cyclists lost their lives. 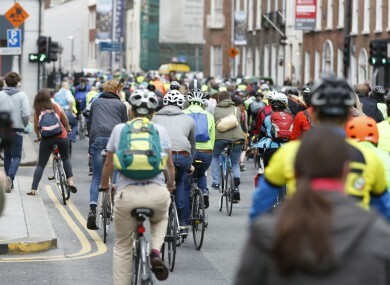 At the launch of an initiative to encourage drivers to slow down and bear cyclists in mind on the roads yesterday, Dublin Cycling Campaign’s Colm Ryder told TheJournal.ie that some people are wary of cycling in the city because they believe it can be dangerous. Vehicles could be banned from travelling east and west on College Green, for example, from later this year if DCC’s ambitious plans for a new civic plaza at the site go ahead. When operational, the Luas Cross City will travel along the front of Trinity College at College Green with taxis and buses but not private cars also allowed use that route. Bus and car traffic on Dame Street will stop at Foster Place South, leaving a space for pedestrians on front of the Bank of Ireland building. A turning point will be built to allow cars and buses turn around and travel back down Dame Street and away from the civic plaza on College Green. A cycleway will also be incorporated that will allow cyclists travel down Westmoreland Street along the Civic Plaza and then further down Dame Street. A more controversial move would see a ban on cars along Eden Quay from O’Connell Street to Marlborough Street, allowing only public transport, taxis and cyclists. This, however, was blocked during a council meeting last month after criticism from businesses in the area. Speaking to TheJournal.ie, Fianna Fáil councillor Paul McAuliffe, who is chair of the council’s enterprise committee, welcomed the news. He said: “While I absolutely believe that the public transport and cyclists are extremely important, the proposals coming sent the message that cars were not allowed. I think the chief executive and the city council have made a pragmatic decision. For Ryder, from the Dublin Cycling Campaign, having “segregated routes” for cyclists on major routes in and out of the city is essential. Examples of segregation on existing Dublin routes includes the Grand Canal between Portobello and Grand Canal Square. Segregated cycle lanes were proposed by the National Transport Authority last week as it unveiled its €1 billion BusConnects plan. Ryder cited the Liffey Cycle Route, for example, as a plan that would effectively provide for cyclists in the capital. It would see a continuous cycle path along the River Liffey, from Heuston Station to Dublin’s docklands and, in parts, incorporate a dedicated cycling boardwalk. One particular problem with the project was that, due to the narrow roadway along part of Ellis and Arran Quays, car and lorry traffic would be diverted from this 450 metre-long stretch, between Blackhall Place and Church Street, along a parallel route through Smithfield. This has, however, been turned down by the council. Another option on the table is a solution that would allow traffic to remain on the quays at this point, but reducing it to one lane at a point. Brendan O’Brien, head of technical services in DCC’s Environment and Transportation department, wrote in a report released last month: “Taking into account we cannot alter Mellowes bridge we then prepared a design which took elements of Option 7, namely the reduction of the quays to one lane, but now only at Mellowes Bridge on the upstream and downstream immediate approaches and combined it with a boardwalk for cyclists on Ellis Quay and Arran Quay. A decision is still awaited on how the Liffey Cycle Route will be built. Ryder maintained that, despite current plans for city traffic meaning less road space for cars, this was a theme common across many European cities. He said: “A lot of European city centres are closing down to not just car traffic but bus traffic too. They’re pedestrianising whole city centres. The business that comes from people who cycle on a regular basis has been proven but businesses have to understand it and believe in it. Public transport and bikes are the future. We’ll have the cross city Luas line finished this year. In the coming years, there’s going to be a huge change in how our city works. Colm Ryder was speaking yesterday at the launch of National Bike Week, which runs from Saturday 10 June to Saturday 17 June. Email “'A lot of people will not get on bikes because they think it's dangerous. We need segregated routes'”. Feedback on “'A lot of people will not get on bikes because they think it's dangerous. We need segregated routes'”.